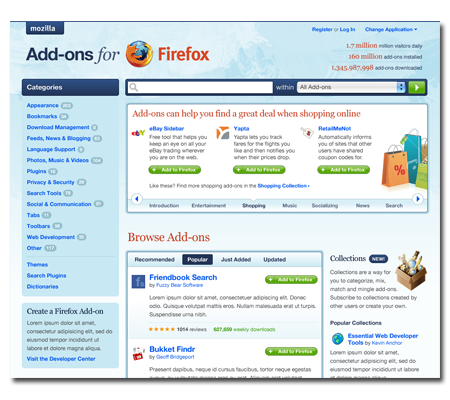 Over the past couple of years, millions of visitors have downloaded add-ons over a billion times from AMO. AMO is an aggregator of community innovation, and it’s an increasingly important way through which our add-ons developers reach a broad and global audience. Until recently, we’ve been focused on building a scalable infrastructure that serves a global community with dozens of localizations. Now that we’ve got the really hard stuff out of the way, it’s time to think about how we can make AMO the best possible showcase for the work of our developer community. We’ve come to realize that while the current site is functional, we wanted to do a better job of explaining add-ons and helping both new and experienced users find fun and useful add-ons through exploration. 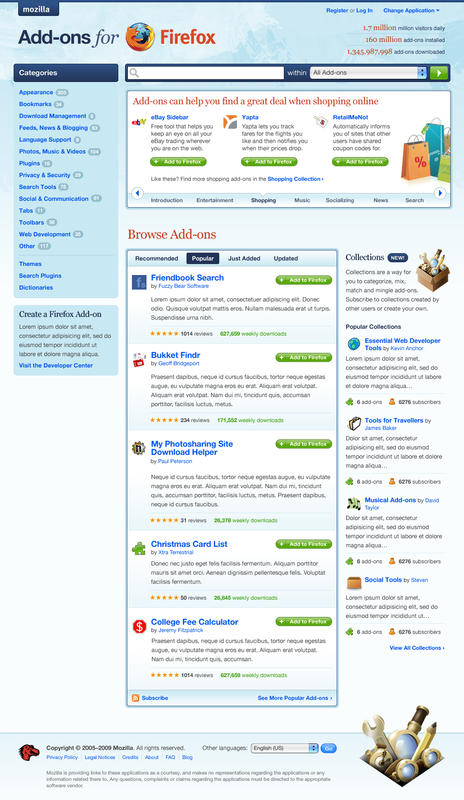 Click through to see a mockup of the new home page. You’ll see we’ve integrated a new promo module that will allow us to feature collections of related add-ons in the top area as well as feature a simple tour that will communicate the value of an add-on to users who have never tried an add-on before. We’ll also launch Collections, a feature that will allow AMO users to share and follow lists of their favorite add-ons. We’re really excited to launch our redesign and want to point out that it was a team effort. Starting with initial designs from Clearleft, we spent lots of time iterating as we showed these designs to Mozillians and the greater community to come up with a solution that we think is an improvement all-around. The AMO team has undertaken a Herculean effort as we convert these designs into the new AMO, with all the localization, accessibility, and scalability that implies. We hope you’ll agree, take a look and let us know what you think. Looks awesome guys, looking forward to the release! I think the select field doesn’t look great on Windows, but it looks OK.
Oh! I like! Pretty AND useful. Nit-pick: The “add to Firefox” buttons look like they’re two buttons due to the line separating the “+” glyph and the text. It still misses version number near extension name. Even in little size, it would be great. At the moment I think the install button is replaced with a message in 6pt font, on a white background, making it practically invisible. add the option to view thumbnail view of each addon instead of an icon !! do it! now! do it ! I don’t like the new design at all, what about the thumbnails instead of the icons? Bring those back! And the colors are ugly. KOS, file a bug at Bugzilla about it. The AMO staff can’t fix it if you avoid telling them at Bugzilla. Please bring back date modified to the search results screens! I reported it on bmo as bug 497793, but no action in over 3 weeks. Your new look for AMO is so full of CSS-Errors (the validator found 211 when I sorted all the themes according to rating) that it is not even possible for me to read the names of the themes because they are overlayd with a) the rating stars and b) the number of ratings. It’s not only annoying, it’s totally embarassing that Mozilla’s website developers are too lazy or to ignorant to write clean html/css. Your own browser shows you are doing something completely wrong! By the way, I’m using Firefox 3.5.1 on Windows XP. I can send you a screenshot, if you don’t believe me. @Daina most of those are warnings caused by border-radius properties and some css3 usage against the w3 parser. None are fatal. The themes page on smaller resolutions is a known issue and is being worked on.